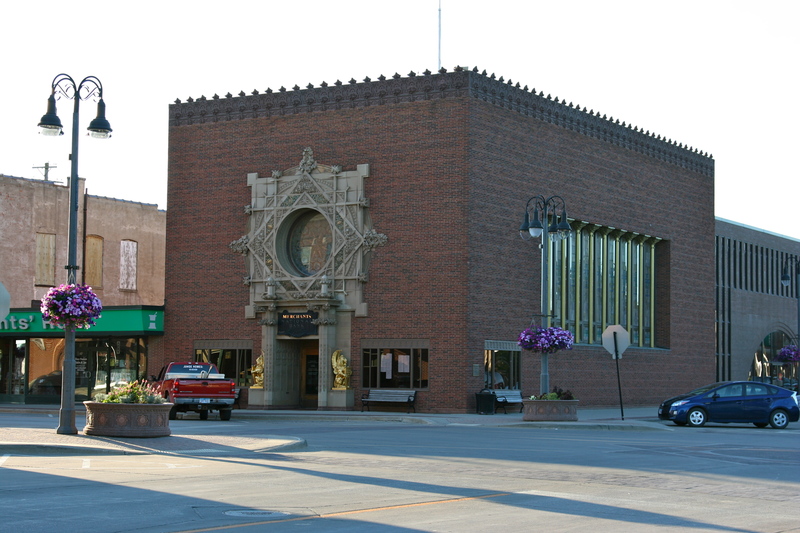 Merchants’ National Bank, Grinnell, IA | ride. travel. live. The Louis Sullivan tour continues! Ninety minutes west of Cedar Rapids, just off of I-80, is the small college town of Grinnell, Iowa, with the archetypical Midwestern Main Street of mom-and-pop shops, a theater, restaurants, and a park housing a number of civic structures. 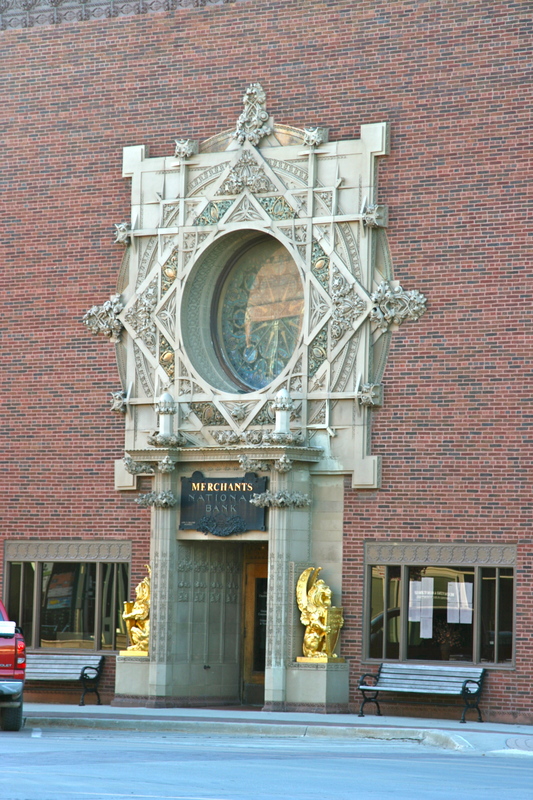 Facing the park is the Merchants’ National Bank (1914), probably Sullivan’s most photographed structure, and easily one of his signature works. The large cartouche, lavishly decorated, stands in contrast to the rest of the building, a simple brick backdrop for the outburst of the main facade. The building is a box made of tapestry brick that lends it a rich dark hue. 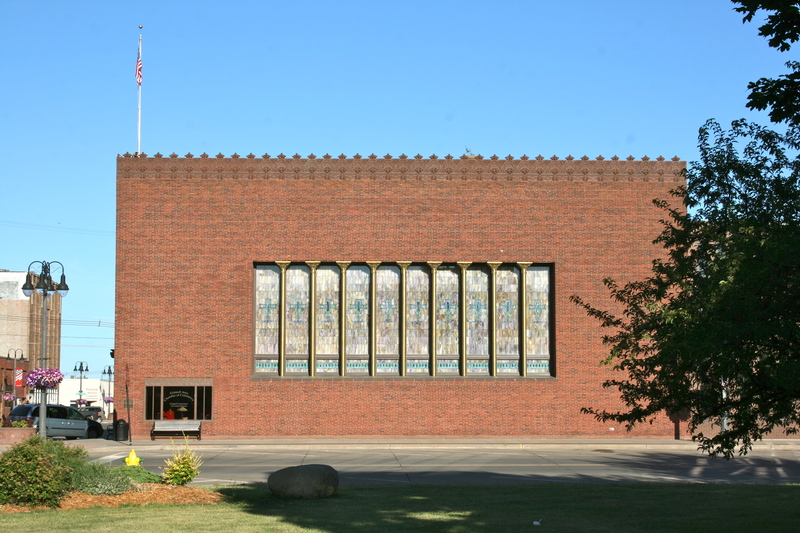 The side facade is lined with a series of stained glass windows, like many of his other bank structures, and the roofline is a repeating motif that gives a Gothic-like variety to the top of the structure. Other than that, there is little in the way of decoration. There is no colored mosaic tile, which was used sparingly in Owatonna, and would not be used again until the construction of his two later banks in Sidney and Newark,Ohio. Something overlooked in the structure is the horizontal element, achieved by a layer of bricks laid crosswise (along the short dimension) every sixth layer, which gives it a subtle rhythm to the otherwise plain surface. His use of tapestry brick was also partially symbolic in addition to being aesthetic, the color variety producing a rich pattern, and could also be seen as a symbol of unity in variety (like “E pluribus unum”) or even as an architectural expression of democracy. It’s well-known that Sullivan was in a middle of a quarter-century long, unrelenting decline, but his powers of design and architecture were brilliant as ever, and a true American original. I can’t really characterize the style of his buildings, Sullivan simply falls into his own category. The sketches for the structure are informative about the state of his architectural practice. Sketches of his Auditorium Building from the 1880s were presented on fancy, scripted Adler and Sullivan letterhead, while Sullivan’s designs for the Grinnell structure were executed on both sides of paper borrowed from a nearby pharmacy. While 1914 would be one of his more productive years after the end of his partnership with Adler, he would complete an average of less than one project per year during the last phase of his career, roughly 1908-1924. He was to be forced out of his tower offices in his Auditorium Building a couple years later, and had great difficulty landing commissions, despite his fame. The influence of his bank structures lives on next door in the extension building to the original bank, a reductionist version of the large arch of his bank in Owatonna, MN. Grinnell obviously loves this building, road signs along US 6 point to the “Jewel Box”, the street corners are decorated in the motif of the cartouche, and it’s now occupied by the Chamber of Commerce. Unfortunately both times I’ve visited Grinnell, I’ve arrived too late to have a look inside, so that will have to wait until next time.